Before I met the hero of this post, I was stuck trying to clean off foundation from my brushes for a long time. I tried everything. 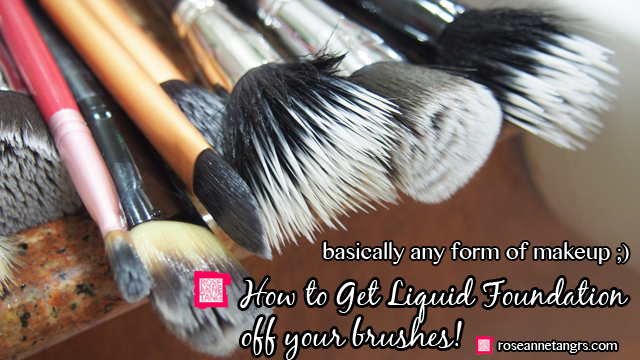 I tried olive oil, oils, brush cleaners from M.A.C – you name it – but nothing could take off liquid foundation off my brushes. It was like it had a permanent stain. How I longed to see those squeaky clean new and white bristles yet again. Until one fineeee day, I met Mr. Daiso Sponge Detergent. He only cost me two bucks at Daiso and I’ve never looked back. Girls, I needa share this with you. You do not deserve to be stuck in dirty brush land ever again! I really don’t know what’s in this stuff. It’s a hybrid of chemicals I guess but they’ve got the combination perfect. Makeup literally melts off your brush. Nothing in comparison. Even if you took surgical alcohol, you wouldn’t be able to come close. It doesn’t just take off foundation, it takes off any form of makeup actually – lipsticks, glosses, anything that’s hard to remove usually. But enough explaining, why not show you. 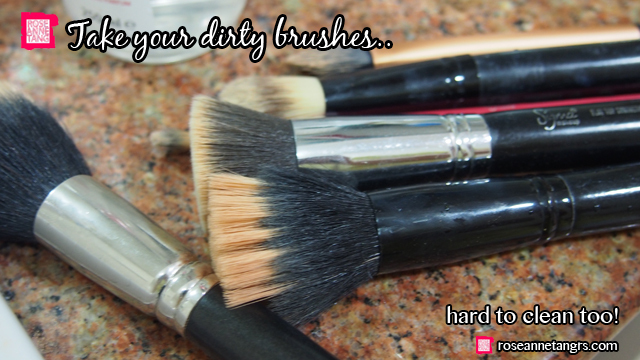 Obviously, get your dirty brushes ready! Foundation is so hard to remove from stippling brushes. I remember my first year of college and I spent 30 minutes trying to get it white again. I made all sorts of methods but none were consistent. There were good brush days and bad brush days. Anyway, it’s all gone now, the past. Take some brush cleaner onto the palm of your hand. It’s a clear white liquid gel that’s more liquid than gel. It has a funny plastic smell but it’s a brush, who cares. 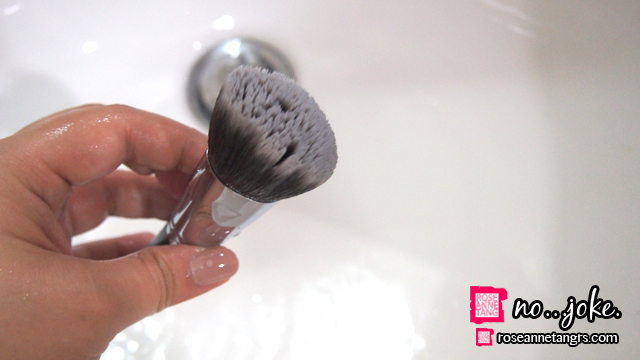 Then, rise your brush before you dip it into the palm and brush cleaner. Swirl the brush into your palm. You should do it with two hands but I have only two hands and one needs to be a photographer. So yeah. Anyway, after you see the foundation just magically melt off your brush like its no effort at all, do a rinse and lay it out to dry. Look at that! It works with synthetic kabukis too. We all know how hard that is. Like seriously. Foundation just lives inside and never comes out. It’s no challenge for the Daiso Sponge Detergent though. It’s expected that it performs this well. Does this even need an explanation? No tragic alcohol smell included. 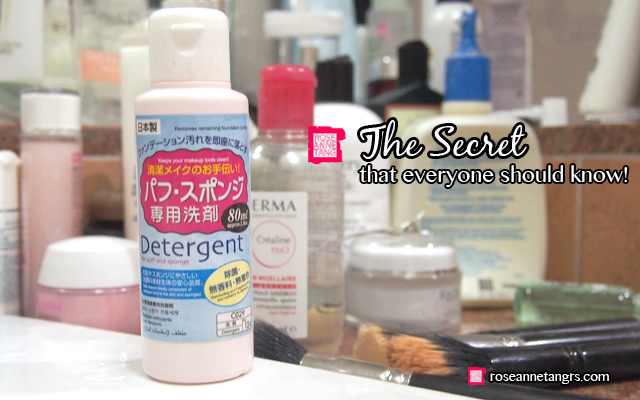 Just a cetaphil-like cleanser for brushes. Hope you liked this post! Nowadays, it’s pretty hard to get your hands on one because it’s usually sold out. But, you can try the Daiso at IMM Mall though because it always has a good stock! Speaking at the SK-II Bridal Shower Event! & SK-II Facial Treatment Essence Giveaway! Sleek Make-up Review/Haul and GIVEAWAY! 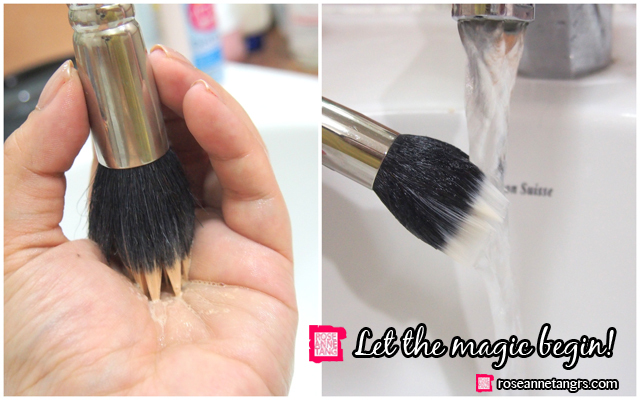 I usually fill a bowl with warm water to a level where the water reaches the full bristles’ length and not the handle(in case glue is loosened), add a few drops of Daiso Sponge detergent, swirl the makeup brushes or let it soak for a little while before swirling my makeup brushes before rinsing under running water. I can clean like 3 foundation brushes, 1 stippling brush and 2-3 eyeshadow brushes in 1 go. When water is totally opaque with foundation, I have to do a new bowl with warm water and Daiso to cleanse more brushes. The only one I might struggle with is lipbrush – I have to wipe off the excess with a makeup wipe before cleansing with Daison. But Daiso is really terrific for makeup brushes with white bristles and easy to stain with full-on colour pigments. Aww, this is so affordable and effective! I’ve always used baby shampoo with olive oil when I cleanse my brushes.. Otherwise I spot clean with Makeup For Ever’s brush cleanser. This is not exactly related to the topic of this entry. But is it possible to get the real techniques brushes in Singapore? Do you want to have a skin that is as smooth as a fiber glass? Do you want to have a skin that looks to be treated by a skin professional? If you want it all, definitely, clarisonic pro sonic skin cleansing is the one you are looking for. Many people did not believe on the capability and capacity of this pro sonic skin cleansing at first.